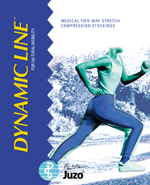 Juzo Dynamic Line offers durable, breathable and comfortable to wear compression stockings that can be worn for any occasion. • Anti-Microbial - Silver inhibits the growth of infectious microbes. • Anti-Odor - Silver ions bind with denatured protein and ammonia reducing unpleasant odors. • Anti-Static - Silver has the highest electrical conductivity rating of any element, thus dissipating electrical charges and eliminating static cling. • Surface Cooling - Silver is the most thermally conductive element, dissipating excess heat away from the garment and the body. • All Natural - Silver is safe, natural and non toxic. • Permanent - Silver is permanently bonded to the surface of the textile fiber. It will never wash out or wear off. Same features as Everyday Sock plus an extra-wide top that stretches comfortably over enlarged feet, ankles and calves (up to 20 inches in the calf area). 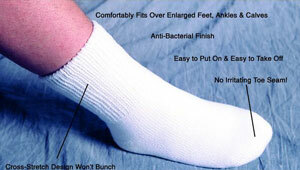 Resilient fibers allow socks to return to original shape after laundering. White only. 96% cotton, 4% elastic. One pair.